The Institute for Advanced Jesuit Studies welcomes applications for its first online course, Jesuit Pedagogy. Students in this three-credit course will study the distinctiveness both of the Jesuits’ approaches to teaching and their philosophy of education. The course is grounded in close reading of primary and secondary sources, from the origins of the Society of Jesus through the beginning of the 21st century. Enrollment is limited, and students are accepted on a rolling basis. The course begins in August 2018. One key to the unprecedented success of Jesuit education has been the tension between the recognizable mark of uniformity that long distinguished the methods, contents, and practices of Jesuit schools and their ability to adapt to different contexts and times. 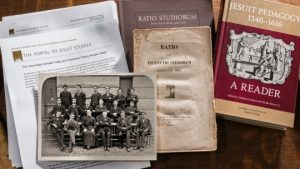 Both aspects—the uniformity and the adaptability—were explicitly supported by the Ratio studiorum, the Jesuits’ foundational plan of studies issued in 1599, which, despite the schools’ many variations and complexities, has retained some influence over time. With the Ratio discarded, Jesuit schools had to clarify what made them distinctively Jesuit, reconciling their mission with the contemporary world. This three-credit, graduate-level class sketches the developments of Jesuit educational endeavors by focusing on both the permanent and changing traits of its distinctive pedagogy. The course is taught by Cristiano Casalini, Ph.D., a Research Scholar at the Institute and an Associate Professor at the Lynch School of Education of Boston College, where he teaches History of Jesuit Education and Philosophy of Education. His field of research is mainly early modern education and especially Jesuit education. He worked on critical texts and commentaries of 16th and 17th century classics of education, especially in and around the Jesuit order. He also provided with Claude Pavur the first volume of a series devoted to the history of Jesuit pedagogy, entitled Jesuit Pedagogy. A Reader (1540–1616) (Boston: Institute of Jesuit Sources, 2016). More information about the course and about the recent changes to the Institute’s Certificate in Jesuit Studies program are available online.